Samdech, Excellencies, Lok Oknha, Ladies, Gentlemen! Today, my wife and I are delighted to be here with you all to launch “Cambodia Kantha Bopha Foundation”. Today is a historic day that we ensure Cambodian children’s continued access to free and quality healthcare. Definitely, this foundation will help relieve financial and mental burden of parents. My wife and I are sorry that Dr. Beat Richner, a hero and the founder of the Switzerland Kantha Bopha Foundation, is not able to attend this event due to his health condition. Nevertheless, I would like to express my deep gratitude to Dr. Beat Richner for his tireless effort and physical, mental and financial sacrifices to realize some great achievements during the last 25 years for the benefit of the Cambodian people in general and Cambodian children in particular. My wife and I wish Dr. Beat Richner a quick recovery. Taking this opportunity, my wife and I wish to thank doctors, nurses and all staff of Kantha Bopha hospitals as well as the current executive director and manager of the Kantha Bopha Foundation in Switzerland for fulfilling their duties with a strong sense of responsibility contributing to the proud reputation and recognition of healthcare provided by this hospital. I wish to express my deep thanks to the government of Switzerland for having provided financial and technical support to Kantha Bopha hospital and I strongly hope that this support will continue. In addition, I deeply thank all domestic and foreign philanthropists for the donations to date and I strongly hope this good deed will continue for the future of Cambodian children, our succeeding generation. Moreover, I wish to express my high appreciation to the Ministry of Economy and Finance for following my instruction by cooperating with the Ministry of Health and Kantha Bopha hospital to brainstorm mechanisms for ensuring the sustainable operation of the hospital. Based on that study, I decide to create the “Cambodia Kantha Bopha Foundation”. My wife and I are delighted to accept the role as “honorary presidents” of the foundation. First, promoting maternal, infant, and children welfare is one of the key priorities of the Royal Government’s National Social Protection Policy Framework. Currently, children aged 9 and below and children aged 14 and below account for around 20% and around 30% respectively of the total population. However, 100% they are our future because they will become our workforce and future generation of parents. Therefore, their health is the key determinant of the future economic and social development of our country. 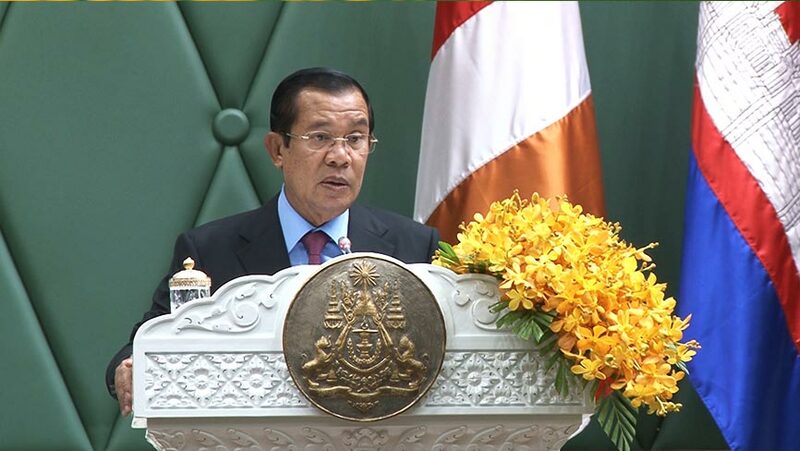 In this sense, Cambodia considers the investment in children healthcare as one of its top priorities. Second, the Royal Government supports the Kantha Bopha hospital because it recognizes the achievements and the quality of maternal, infant and child healthcare provided by this hospital. Given the limited budget and resources, we cannot achieve our ambition of establishing such hospital nationwide, we envisage the continued operation of this hospital as the first model hospital in the country. Nevertheless, there are already Kantha Bopha hospitals and going forward, we are determined to support the hospitals so that they are able to continue their non-for-profit operation to provide free and non-discriminate healthcare to children. Overall, we are proud that Cambodia has quality children hospital that responds to the demand for maternal, infant and child healthcare. One of the hospitals, Jayavarman 7 hospital in Siem Reap province, has been providing free maternal healthcare which contributes to the reduction of maternal and infant mortality rates in Cambodia. Third, on the financial aspect, while we have constantly increased budget allocation as well as allocation of some revenue from the sale of tickets to Angkor Wat to Kantha Bopha hospital, it is now the right time to create our own “Cambodia Kantha Bopha Foundatoin”. We are aware that we cannot continue to rely on Dr. Beat Richner to raise funds forever and proceeds from “Switzerland Kantha Bopha Foundation” might deteriorate someday. Moreover, our economic strength and financial resources as well as the spirit of domestic philanthropists are in better shape along with stronger support from the public will provide more impetus for the hospital. Increasing salaries for government officials and members of armed forces to over one million Riels so as to enhance their living standards and to improve effectiveness of public service delivery. Increasing investment in human resources combined with the implementation of the National Social Protection Policy Framework 2017-2025 of the Royal Government, especially significant increase in expenditure on the social sector to enhance the quality and expand the coverage of public service to move them closer to service users. Between 2013 and 2018, public expenditure on this sector has increased constantly from about 4.25% of GDP to about 5.71% of GDP, of which the total expenditure of the Ministry of Education, Youth and Sport has increased over threefold, the total expenditure of the Ministry of Health has increased about two and a half times, and the total expenditure of the Ministry of Social Affairs, Veterans, and Youth Rehabilitation as well as the total expenditure of the Ministry of Labor and Vocational Training has also increased almost two times. 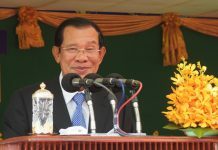 Certainly, for the up-coming sixth legislative term, if I continue to be entrusted by the Cambodian people to lead the country as the Prime Minister of the Kingdom of Cambodia, I would continue to unwaveringly adhere to the 4 priorities for national development by continuing attention to human resources as the first of the order of the Royal Government’s socio-economic policy agenda. The Royal Government has decided to establish the “Cambodia Kantha Bopha Foundation” as a Trust, which follows the international practice in managing large charity funds. Furthermore, the management of this foundation, in particular, the Board of Trustees, consists of important dignitaries, such as H.E Dr. Aun Pornmoniroth, Senior Minister, Minister of Economy and Finance and H.E Dr. Mam Bun Heng, Minister of Health, as well as participation of the Kantha Bopha Hospital management, which reflects transparency and credibility of management and use of the fund. With respect to the use of resources of the Foundation, procedures have already been developed and simplified to avoid complexity while ensuring transparency, accountability and consistency with “Switzerland Kantha Bopha Foundation” in the disbursement process to ensure Kantha Bopha Hospital’s sustainability. I also would like to emphasize that although the Royal Government has established the “Cambodia Kantha Bopha Foundation”, it does not replace the “Switzerland Kantha Bopha Foundation”. The two foundations will operate in tandem and collaboration with “Switzerland Kantha Bopha Foundation” will continue to be crucial for the hospital’s operation. Taking this opportunity, I would like to sincerely thank and compliment domestic and foreign philanthropists for the donations to the Kantha Bopha Hospital to date, and appeal to Samdech, Excellencies, Ladies, and Gentlemen to further donate to this foundation for the sake of Cambodia’s maternal and infant welfare. Moreover, Samdech, Excellencies, Ladies and Gentlemen and philanthropists can also become honorary or supporting members of the foundation according to the size and condition of donation stated in the Sub-Decree. You all can also make your charitable donations in this ceremony because the management of the Cambodia Kantha Bopha Foundation has assigned a group to record and accept charitable donations from you. 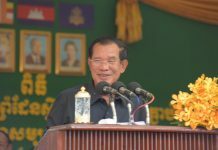 From this forum, as the head of the Royal Government of Cambodia, I auspiciously declare that as long as this country can maintain peace, stability, and public order which are indispensable preconditions for continued social and economic development, the health sector, in general, and quality operation of the Kantha Bopha Hospital, in particular, will continue to receive a top consideration from the Royal Government of Cambodia. 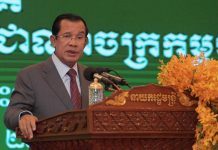 In this spirit, H.E Dr. Aun Pornmoniroth has already informed earlier that with the launch of the “Cambodia Kantha Bopha Foundation” as a trust, the Royal Government of Cambodia, as its founder and Chair of Trustees, has decided to make an initial total contribution of 40.25 billion Riels or approximately US$10 million as a reserve into the Cambodia Kantha Bopha Foundation. For the next term, if I continue to be the Prime Minister, the Royal Government under my leadership will continue to provide continuous support to the Kantha Bopha Hospital to ensure its sustainable operation in providing quality and free treatment and healthcare services by contributing at least $10 million per annum for the operation of the Hospital and at least $5 million per annum for “Cambodia Kantha Bopha Foundation” along with continued allocation of revenue from the sale of ticket to Angkor Wat to the Hospital on permanent basis. Before concluding, I kindly ask the board of trustees and the management of the Foundation to ensure professional administration and to continue to mobilize support and donations as much as possible and to consider the organization of annual fund raising events for the common cause of our nation: Welfare of Cambodian Children. Also, I would like to remind all medical and non-medical staff of the Kantha Bopha Hospital to continue to fulfil your duties according to the code of conduct, contributing to strengthening Cambodian medical staff’s virtue as well as further capacity development to maintain and strengthen the quality of treatment and health care services in the already well-functioning Hospital. Finally, with the declaration of the official launch of the “Cambodia Kantha Bopha Foundation” at this moment, I would like to wish All Samdech, Excellencies, Ladies and Gentlemen, Distinguished National and International Guests the Four Gems of Buddha’s Blessings, namely Longevity, Nobility, Healthiness, and Strength. We also may have to think of making some kinds of insignia to commemorate people’s contributions […] for those who are founding members, they may have a life-time diploma. For honorary and supporting members, they may have some kinds of souvenir insignia which should not exceed the amount they contributed of course. In Thailand, they make and offer a bangles as a sign of people making contribution for this or that fund […]./.